Financial toxicity after breast cancer may be exacerbated by adverse treatment effects, like breast cancer-related lymphedema. 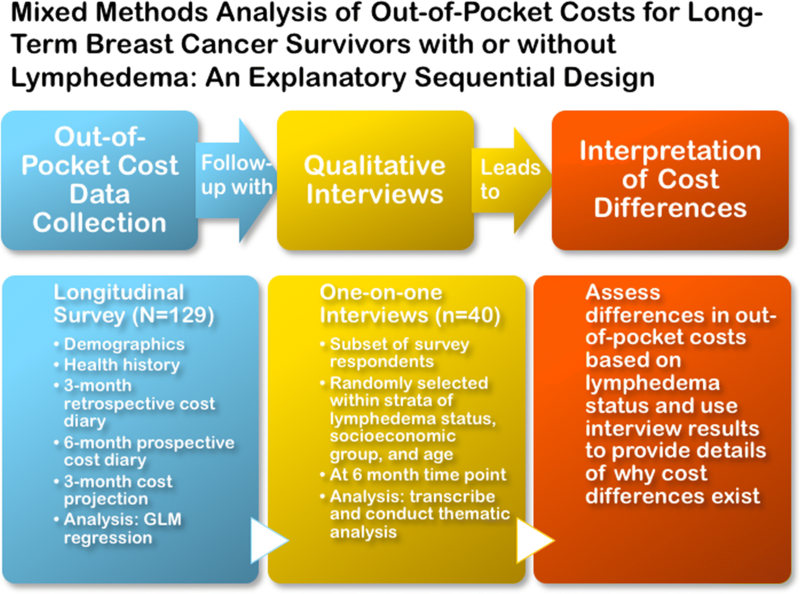 As the first study of long-term out-of-pocket costs for breast cancer survivors in the USA with lymphedema, this mixed methods study compares out-of-pocket costs for breast cancer survivors with and without lymphedema. In 2015, 129 breast cancer survivors from Pennsylvania and New Jersey completed surveys on demographics, economically burdensome events since cancer diagnosis, cancer treatment factors, insurance, and comorbidities; and prospective monthly out-of-pocket cost diaries over 12 months. Forty participants completed in-person semi-structured interviews. GLM regression predicted annual dollar amount estimates. 46.5% of participants had lymphedema. Mean age was 63 years (SD = 8). Average time since cancer diagnosis was 12 years (SD = 5). Over 98% had insurance. Annual adjusted health-related out-of-pocket costs excluding productivity losses totaled $2306 compared to $1090 (p = 0.006) for those without lymphedema, or including productivity losses, $3325 compared to $2792 (p = 0.55). Interviews suggested that the cascading nature of economic burden on long-term savings and work opportunities, and insufficiency of insurance to cover lymphedema-related needs drove cost differences. Higher costs delayed retirement, reduced employment, and increased inability to access lymphedema care. Long-term cancer survivors with lymphedema may face up to 112% higher out-of-pocket costs than those without lymphedema, which influences lymphedema management, and has lasting impact on savings and productivity. Findings reinforce the need for actions at policy, provider, and individual patient levels, to reduce lymphedema costs. Future work should explore patient-driven recommendations to reduce economic burden after cancer. The online version of this article ( https://doi.org/10.1007/s00520-018-4418-4) contains supplementary material, which is available to authorized users. From May to September of 2015, 258 women were screened by phone for eligibility to the PAL Social Economic and Quality of Life (PAL SEQL) follow-up study. Recruits were identified from prior participants of the Physical Activity and Lymphedema (PAL) trial (n = 295) [29, 30] who were still alive or participants who were ineligible (n = 163) for the ongoing Women in Steady Exercise Research (WISER) Survivor Study (ClinicalTrials.gov #NCT01515124) , but met requirements for entry into PAL. All participants who had agreed to be contacted about future studies and had up-to-date contact information were contacted. Eligibility criteria included women with stages I–III invasive breast cancer, completion of active breast cancer treatment, > 1 lymph node removed, and current residents of Pennsylvania or New Jersey. Those with active cancer, or who were pregnant or planning to become pregnant in the next 6 months were excluded. Of those screened, 37 were ineligible, and 96 declined or dropped out due to lack of time to commit to a longitudinal study. Figure 1 describes the conceptual overview of the mixed methods study design. The Institutional Review Board of the University of Pennsylvania approved the study. Written informed consent was obtained from all individual participants. Participants completed a measurement visit at baseline and 6 months that included measures of upper extremity lymphedema severity. Participants self-reported current age, US census-defined race, and socio-economic position. Consumer credit was included because cancer diagnosis has been associated with increased bankruptcy rates [6, 32], which would have an impact on a patient’s consumer credit rating for up to 10 years. Self-reported health insurance was classified as public (Medicaid or Medicare), private, or none. Participants reporting both public and private insurance were counted in both categories. The data collection instrument developed was based on Goossens’ cost diary , a validated tool for cost-effectiveness analysis. Participants were instructed to report direct, indirect, and productivity costs related to their overall healthcare including the following: co-payments for outpatient physician visits, physical and occupational therapy visits, complementary and integrative therapy visits, emergency department visits, hospitalizations, labs, X-rays, and tests; wellness resources (e.g., gym memberships); all lymphedema-specific healthcare needs (compression garments, bandages) for lymphedema in any part of the body; medications or other health-related product that a participant identified; and health insurance premiums if paid out-of-pocket (Appendix I in the supplementary material). All out-of-pocket costs were collected in continuous dollar amounts. Similar to methods used in previously published cost studies of adverse effects of cancer treatment , participants reported 12 months of cost data. This was captured through a 3-month retrospective cost diary, then six monthly prospective cost diaries, followed by an estimation of projected costs in the upcoming 3 months. For the 3-month retrospective and 6-month prospective data collection, participants were encouraged to use personal calendars, insurance statements, and receipts to aid in recall. The following 3-month projection was designed to capture any regularly occurring appointment co-pays, such as those for annual check-ups, that did not fall in the earlier time windows that out-of-pocket costs data were being prospectively recorded. Altogether, participants supplied 12 months of cost data and each cost was summed across all the data collection points. For each itemized question, participants with lymphedema designated which costs were related to lymphedema. We considered 12-month costs including and excluding productivity costs to differentiate direct medical and non-medical, and indirect cost domains . Productivity losses for work and for home were calculated based on methods used in a previously published paper that estimated economic burden for US cancer survivors  based on self-reported days unable to perform usual activities or hours of help needed to carry out daily activities. For work productivity losses, the adjusted mean number of missed workdays was multiplied by the US Bureau of Labor Statistics estimates for the median hourly wage ($16.87) based on a 6-h workday. For household productivity losses, the mean number of hours that someone needed help was multiplied by the daily household productivity rate ($43.37 per day) based on the consumer price index. At baseline, participants completed a self-administered survey on economic burden using 12 items adapted from the Breast Cancer Finances Survey [36, 37], a validated survey of economically burdensome events among breast cancer survivors that assesses burden related to long-term survival. Participants self-reported completing chemotherapy and/or radiation therapy and/or hormone therapy after cancer surgery, and year of breast cancer diagnosis. Self-report of breast cancer treatment has been validated as over 90% accurate . Whether patients underwent multiple adjuvant treatment modalities is more important than the details of treatment; thus, we modeled the total number of types of treatments. Participants self-reported any of 23 comorbidities and previous diagnosis of breast cancer-related lymphedema. To measure upper extremity lymphedema severity, interlimb volume difference measurements between the affected and unaffected arms were taken using perometry (Juzo, Germany), and were adjusted for humidity, barometric pressure, and time of day. Women who wore compression garments were asked to remove them for at least 1 h prior to perometry assessment. As depicted in Fig. 1, the explanatory sequential design  of this mixed methods study included 30-min qualitative interviews at the end of monthly prospective out-of-pocket cost data collection. This method entails first collecting quantitative data, and then collecting qualitative data to inform and provide context for quantitative findings. 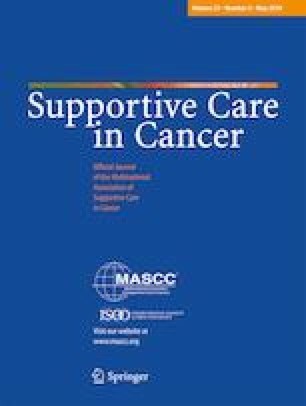 This approach used data from semi-structured interviews to explore what might drive cost differences between breast cancer survivors with and without lymphedema, and capture ways in which long-term economic burden might affect breast cancer survivors that might not be easily quantifiable with a cost diary approach alone. A standardized semi structured interview guide (Appendix II in the supplementary material), developed by the study PI, included questions on economic challenges, supports utilized, lasting impact and resource gaps after participants’ breast cancer diagnosis. The study PI and a trained research assistant conducted interviews with a subset of 40 participants who were purposively sampled to ensure equal representation across three sampling categories: lymphedema status, socioeconomic position (high school or less vs. college or more), and age group (over 65 and under 65). The sample included 40 participants to ensure at least 10 participants per each sampling category and the potential to reach saturation of themes. Participants were randomly selected using a random number generator and placed into each sampling category until there were at least ten in each category. For quantitative analysis of the entire study sample, baseline statistical differences between demographic characteristics were calculated using Chi-squared test and Fischer’s statistic for demographic categories with less than five respondents, and non-parametric Ranksum test for non-normally continuously distributed variables. A generalized linear model (GLM) with the power 0.5 link and negative binomial family was used to account for over dispersion because the cost outcome variables contained several zeros and the variance exceeded the mean distribution, which is common with health care cost data. After the model was fitted, the marginal effects of the total cost for those with and without lymphedema were calculated and graphed, adjusted for each covariate at its mean. Two separate GLM models were estimated: one for the total cost including and one for the total cost excluding productivity costs. For qualitative analysis of the 40 interviewees, verbatim interview transcripts were inputted into MAXQDA software program for qualitative analysis. First, structural codes based on interview questions and domains of economic burden among cancer survivors documented in the literature were identified. Additional codes were included after transcripts were reviewed for themes. The research team organized these codes into a codebook, which was used for thematic coding. Each fifth transcript was double coded and discrepancies were discussed and resolved among the research team. Quotes were collected to illustrate key findings and ensure that conclusions were consistent with the data. The 129 participants who completed data for the study are described in Table 1. Across the entire sample, the mean age was 63 and the average time since cancer diagnosis was 12 years. Just under half (46.5%) of participants had been diagnosed with lymphedema. There was no statistically significant difference by lymphedema status in mean age, race, education, social status, wealth, credit score, type of insurance, or number of economically burdensome events. A significantly greater percentage of women with lymphedema were in a lower income category (p = 0.02) compared to those without lymphedema. Cancer stage at diagnosis, type of adjuvant treatments, and number of comorbidities did not differ by lymphedema status, but those with lymphedema were on average 3 years farther out from diagnosis (p = 0.002) and had greater interlimb difference (p < 0.001). Figure 2 compares the average dollar amount difference, with and without productivity losses, for those who did not have lymphedema and those who did, controlling for age, race, socioeconomic position, type of cancer treatments, comorbidities, years since cancer diagnosis, and type of insurance. Excluding productivity losses, participants with lymphedema are estimated to have an average $2306 in out-of-pocket costs per year compared to $1090 for those without lymphedema (p = 0.006), or 112% higher costs (Fig. 2a). 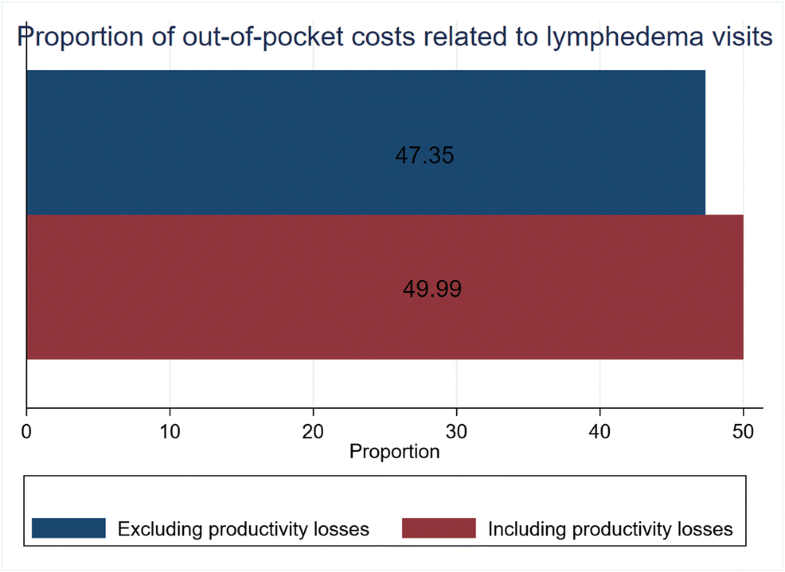 Including productivity losses, participants with lymphedema are estimated to have an average $3325 in out-of-pocket costs per year compared to $2792 for those without lymphedema (p = 0.55), or 19% higher costs (Fig. 2b). Among those reporting having lymphedema, Fig. 3 shows that nearly 50% of total costs were attributed to lymphedema. Table 2 contains illustrative quotes that demonstrate the three major themes that emerged from the qualitative interviews comparing breast cancer survivors across lymphedema status. These interviews provide further insight into the burden of higher costs associated with lymphedema. Theme 1: Economic burden is cumulative and cascades over time; managing an adverse treatment effect presents ongoing challenges. The use of savings to cover medical costs and additional loans or debt to cover medical costs was common in all respondent interviews. For some women, covering medical costs compromised their ability to manage basic needs like utility bills. Women with lymphedema were more likely to relay that the upfront costs associated with cancer set off a cascade of financial challenges that continues to affect their current economic situation. Participants described current effects such as decreased ability to help family, support their children’s educational endeavors, and retire. Ongoing costs for lymphedema care needs exacerbated economic burden and compromised participants’ ability to obtain care for their current lymphedema needs. Theme 2: Lymphedema care needs are unlikely to be covered by insurance, which contributes to higher long-term costs and compromises a patient’s ability to manage lymphedema symptoms. Respondents in both groups reported out-of-pocket health care costs and shifting costs to other parties (including family, employers, social service organizations, and advocacy groups). Participants described the need to use leftovers of patients’ medications to cope with their economic burden. Women who did not have lymphedema were more likely to report out-of-pocket costs accrued closer to the period of their cancer treatment for supplemental insurance, co-pays, and treatment, while women with lymphedema reported additional ongoing long-term out-of-pockets costs for lymphedema care in the form of ongoing physical therapy, lymphedema specialists, sleeves, and garments that were not covered by insurance. Even participants with private insurance did not always receive necessary lymphedema-specific care because of the cost burden. Changes in insurance, especially when changes in status led to less lymphedema coverage, further stymied their ability to manage ongoing lymphedema needs. Theme 3: Productivity losses have long-term impact: breast cancer diagnosis may have influenced work opportunities and long-term earning potential, and breast cancer-related lymphedema may further decrease productivity losses at work. Both sets of participants spoke about long-term productivity losses. In some cases, women missed out on educational opportunities, modified work schedules, experienced job loss, pursued voluntary early retirement, or went back to work sooner than medically recommended. These experiences framed their subsequent health and lifestyles and still affect them currently. Women in both sets recalled needing additional help for duties around the house. Women with lymphedema were less likely to return to employment after cancer because of their additional physical challenges. Study results suggest that the economic burden of breast cancer continues long after diagnosis. Women with lymphedema experience a higher burden, with or without indirect cost considerations. In the long term, women report losses to economic opportunity due to their cancer and lymphedema diagnoses. Despite the expansion of cancer-related insurance coverage under the Affordable Care Act, breast cancer survivors, with and without lymphedema, still face significant financial need. 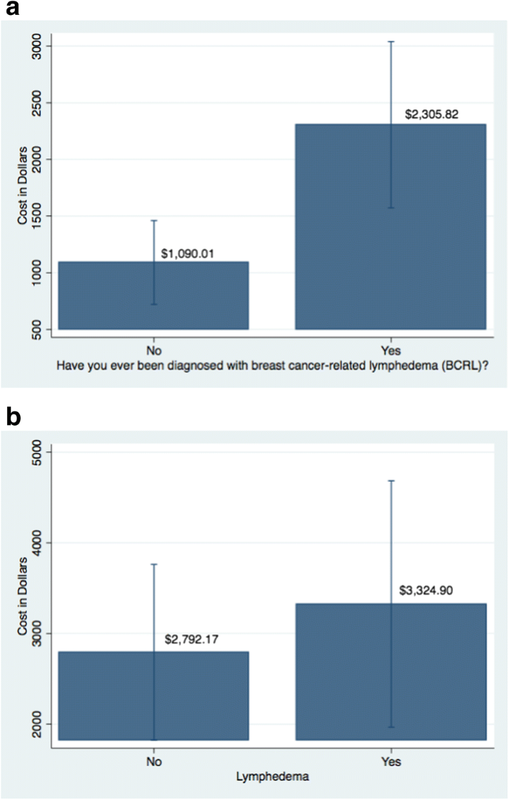 Breast cancer survivors with lymphedema faced up to 112% higher total out-of-pocket costs when excluding productivity losses and up to 19% higher total out-of-pocket costs when including productivity losses, compared to those without lymphedema. The average out-of-pocket costs estimated in this study are lower than the roughly $11,000 per year previously estimated for US women ; however, previous estimates are based on costs closer to the time of treatment, when overall healthcare needs may be higher, and are based on women of working age, who would not have out-of-pockets subsidized by Medicare. These estimates are based on insurance claims, and not patient out-of-pocket costs, which may also contribute to why previous estimates differ from those found in the present study. Even though our costs are lower than previously estimated, the study provides evidence that costs for women with lymphedema remain significantly elevated long after cancer treatment. On average, there is a $500–$1215 difference. These economic burdens occur even among those who have health insurance. Although nearly all of the women in the sample had some form of insurance, changes and challenges with insurance consistently complicated issues for both women who had lymphedema and those who did not. Studies conducted before the 2010 Affordable Care Act reported that financial burden created worry and anger when tools for lymphedema management were not covered by insurance . The present study suggests that these challenges persist even after the Affordable Care Act, which has the potential to expand health insurance coverage for cancer-related care  and for cancer survivors [42, 43]. For women cancer survivors with lymphedema, who continued to manage a disease long after completing cancer treatment, these challenges persisted due to ongoing needs for lymphedema care. Women who did not have lymphedema reported insurance challenges related to coverage of cancer treatment and co-pays at the time of treatment but did not report challenges with current care. Insurance coverage of lymphedema care varied over time and changed based on insurer. Previous findings suggest persistently high costs for cancer survivors who are insured by public insurance , which are particularly relevant because coverage for lymphedema treatment varies for public insurance . Medicare covers: medically necessary manual lymph drainage performed by physical or occupational therapists, compression bandaging services, patient education on lymphedema self-care and lymphatic decongestion exercises, and pneumatic compression devices, but not for all compression self-management equipment (such as bandages). Medicaid expands on that coverage, with a few states covering compression garments and bandages. Switching from private to public insurance often posed the most problems when public and private insurance covered lymphedema differently such that patients’ needs were no longer met. When patients could not cover their costs, family members or social service organizations were sometimes able to help, but often patients simply went without the care they needed. Other studies have suggested that high out-of-pocket costs will cause patients to use compression garments that no longer apply sufficient pressure to manage lymphedema , which participants in our study corroborated. Interview participants reported that lack of coverage for lymphedema-related costs contributed to less lymphedema management and exacerbation of lymphedema. This study confirmed that higher costs can only be partly attributed to lymphedema, above and beyond the presence of other comorbidities. Interview data suggest that higher costs for women with lymphedema stemmed from cumulatively high economic burden that cascaded over time and prevented women from fully recovering financially. It also highlighted that examining only financial costs due to lymphedema underestimates its full cumulative effect of economic burden on ability to afford other basic needs. Use of savings and retirement to cover lymphedema and healthcare costs can affect women long term and have intergenerational effects. Managing breast cancer-related lymphedema presents ongoing challenges, and adherence can be difficult due to ongoing costs. Having access to additional resources through family, credit, or savings is often leveraged, but may never be recovered, especially for those with ongoing lymphedema management needs. The findings of this study are especially timely given the recent calls to reduce financial toxicity in US cancer patients through individual-level strategies, as encouraging healthier behaviors  and greater financial disclosure [48, 49]. But these strategies put the onus on patients to act in order to reduce cost, rather than pointing to healthcare systems to change to reduce costs. This approach may widen disparities since patients with the greatest resources will be able to afford better health, thus reducing costs is paramount. Some scholars have explored healthcare provider-driven recommendations to reduce economic burden . Other scholars have called for introducing screening for financial toxicity, as well as a multi-level approach to reducing economic burden , and redesigning sick leave policies to better accommodate chronic disease needs . For mitigating lymphedema costs in particular, advocates have supported the Lymphedema Treatment Act, which would amend Title XVIII (Medicare) of the Social Security Act to cover certain lymphedema compression treatment items as durable medical equipment under Medicare. Some states, including California, Louisiana, North Carolina, and Virginia, have issued their own laws, but the Act has not found success at the US Congressional level. A 2016 report found that expanding insurance coverage in one state had a less than 0.1% impact on insurance claims, while lowering costs for lymphedema treatment and lymphedema-related hospitalizations . Our findings reinforce the need for actions at policy, provider, and individual patient levels, especially for those with lymphedema. This analysis consisted of a small sample from one geographic area, the majority of whom had insurance, which may limit the external validity of the findings, especially given that insurance policies differ regionally. Responses may be different from women living in regions with other insurance offerings. Cost diaries pose a time burden on participants to complete, which may have led to missing entries: monthly text-based, e-mail, and phone messaging was used to remind participants to complete their diaries. Participants were also allowed to send in receipts and medical visit bill summaries in lieu of writing them into the cost diaries themselves. Nonetheless, the data that were collected comprehensively covered cost domains in real time, with over a 90% response rate in each month of data collected. Cost data collection was not prospective throughout, and the 3-month retrospective data may have been biased due to recall; to minimize the potential for bias, participants were asked to use supporting documents to aid in recall. The final 3 months were based on projected costs due to regular ongoing medical visits or needs, leading to underestimated costs because unexpected healthcare needs would not be included. Cost diaries may not comprehensively capture the various domains of direct, indirect, psychosocial, and time costs and only measure costs over the period of observation; thus, we used qualitative data to supplement our understanding of how and when various types of costs were incurred during the course of survivorship. These challenges mean that the cost estimates are conservative, and that actual out-of-pocket costs are likely higher than reported here. There may have been other clinical factors to consider that may influence cost, like cancer severity  as the initial economic shock that set patients on different financial trajectories. Data on stage at cancer diagnosis were excluded from the regression analysis due to a high percentage of missing data (16%), although available data suggest no difference in stage of diagnosis by lymphedema status. As a voluntary research study, those experiencing the greatest economic or health challenges may not have had time to enroll and participate, meaning that our results may underestimate economic burden. Results may not be generalizable to those with higher cancer stage, older age, or other tumor sites other than the breast, but breast cancer is among the most economically burdensome cancers. Breast cancer survivors with lymphedema face higher costs than those who do not have lymphedema, even many years after cancer diagnosis. Although women with and without lymphedema experience a similar number of economically burdensome events and comorbidities, high out-of-pocket costs for women with breast cancer-related lymphedema lead to a cascade of other economic challenges that persist long after cancer treatment. Future work should explore patient-driven recommendations to reduce economic burden after cancer. This work was supported by the National Center for Research Resources and the National Center for Advancing Translational Sciences (NCATS) of the National Institutes of Health through grant 1UL1TR001079 (statistical consultation); the National Cancer Institute grant K01CA184288 (Lorraine T. Dean); the National Institute of Mental Health grant R25MH083620 (Lorraine T. Dean, Yusuf Ransome); the Sidney Kimmel Cancer Center grant P30CA006973 (Lorraine T. Dean, Kala Visvanathan, Yuehan Zhang); Johns Hopkins University Center for AIDS Research grant P30AI094189 (Lorraine T. Dean); the National Institute on Drug Abuse grant T32DA031099 (Shadiya L. Moss), National Institutes of Mental Health K01MH111374 (Yusuf Ransome); the National Institute on Aging grant K01AG04176 (Lauren Hersch Nicholas); and the National Cancer Institute grants R01CA106851 and 1U54CA155850-01 (Kathryn H. Schmitz).